Of the 2 million Syrians displaced in neighbouring countries, over 500 000 have found shelter in 21 Turkish camps and private accommodation in 10 provinces. Turkish health authorities plan two rounds of supplementary immunization activities by the end of the year for all children under 5 years of age in selected provinces and for refugee children elsewhere in Turkey. Along with improved surveillance, an active search is being conducted to provide additional doses of vaccine to un- and under immunized resident children nationwide. The WHO field presence opened on 10 October, to work with Turkish authorities in addressing the evolving health needs of Syrian refugees in the country, and to support WHO’s global response to the crisis in the Syrian Arab Republic. Staffed with an emergency health coordinator and logistics/administration expertise, the field presence will inform and coordinate health partners providing services to Syrians in southern Turkey. 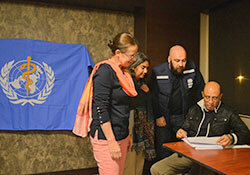 WHO’s collaboration with the Government of Turkey on this issue began in December 2012 with an interagency field assessment and follow-up missions, and has now been consolidated in the new WHO presence. In light of the suspected polio outbreak in the Syrian Arab Republic, WHO plans to enhance its field presence to support the Turkish response. World Polio Day, 24 October, is a reminder that the goal of a world without polio is reachable, but countries must maintain the current momentum to eradicate this deadly disease.